First of all, a thank you to you faithful reader for all of your kind words and compliments. They mean the world to me. I have received several comments and emails this week with questions about either the gowns our baby has worn or about my sewing room. Cynthia G asked about the gown featured here. She was wondering which issue of Creative Needle the gown was in. The handsewn gown was a pattern provided by Jeannie Baumeister of The Old Fashioned Baby. I am not sure if it was featured in Creative Needle or not. The pattern was part of a class from SAGA convention in 2009. Betty asked what the fabric the handsewn gown was made with. It is made from Swiss Nelona. A 100% cotton fabric that is wonderful to work with. 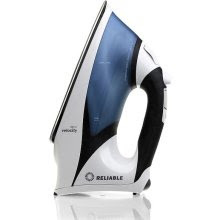 Rettabug asked what kind of iron I have. I have a Digital Velocity iron by Reliable Corp.
Rettabug also asked what I meant by "carpy." I think she was hoping it was a typo. No, it was just a nicer way of saying what I really think. I'll let your imagination run away with you. 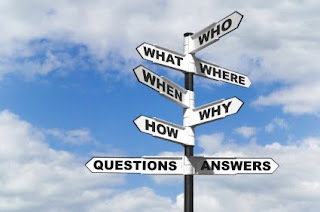 Cynthia G asked what are the dimensions of the sewing room? The room is a tad over 12 x 14. 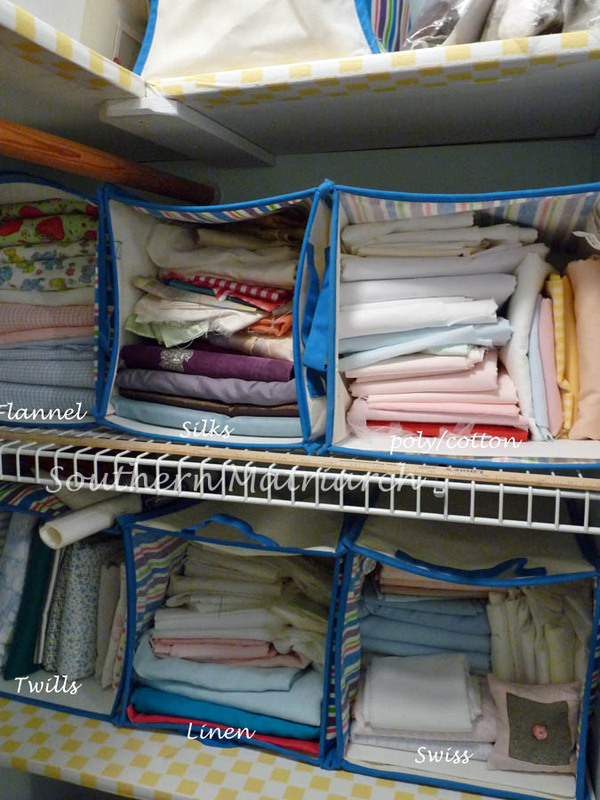 Not really big by some standards but for me its the largest sewing room I have ever had. Sarah emailed to ask about my sewing machine table and the turntable I talked about. The turntable is part of the cabinet/tabletop. See the black knob in the left picture that is to the right of the machine? Pull that knob over to the left and it swings the back machine to the front and vice versa. No need for an additional table. I was also asked to identify my stash. Here goes. Click on each picture to enlarge. This is the right hand side of the closet. The bottom two shelves. This is also the right hand of the closet but the upper two shelves. This is two of the three shelves on the left. 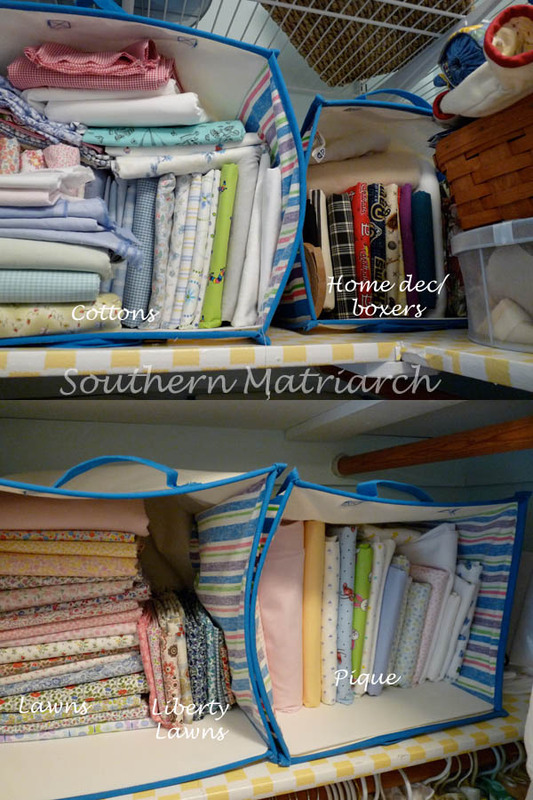 The very top shelf (not pictured) has two bins that contain some tulle ad organza plus a small basket with a few fat quarters and some small pieces of quilting cotton. That pima cotton bin is bulging. I will have to use more of it sooner. My stash has diminished greatly but I am a okay with it. I love being able to see what I have without digging through it. I don't do well at stores like TJ Maxx or Big Lots because I am not a "digger." If it is not right where I can see it, I don't look too far. So now my stash doesn't have to be dug through either. There is only one piece of fabric that I don't really see having a use for. It is a piece of purple silk with silver embroidery. My girlfriend sent it to me from Africa. I kept it because I love her and it is a very unusual piece. Other than that, I can see using all of these fabrics before I am too feeble to know how. This has been very freeing for me. Lest you feel too sorry for me, there is some fabric that isn't shown here. It lives in two different dressers in the other bedrooms. The right hand one above is one of them. It is full of class kits and Wendy Schoen's Embroidery Club. Almost all of those have fabric with them. So there is additional fabric. I'll be fine. 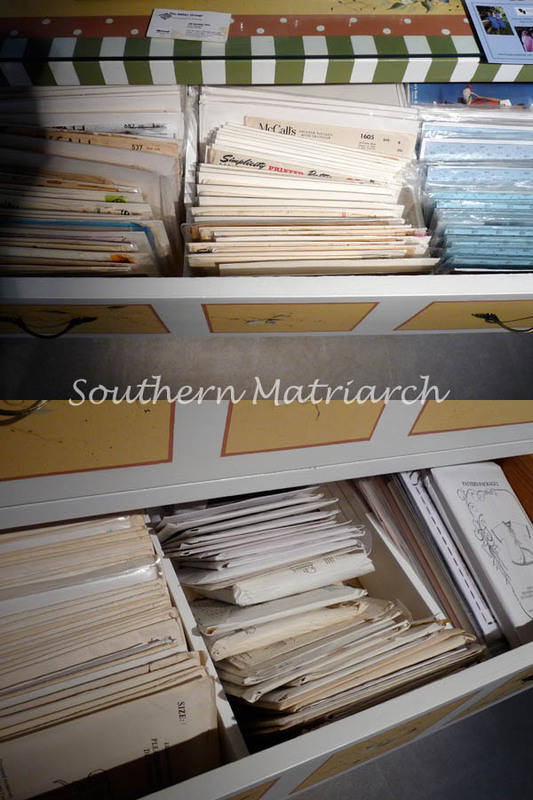 My patterns are stored in the left hand dresser. Again in the other bedroom that was my former sewing room. 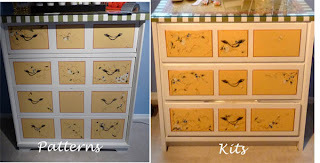 This shows two of the drawers with my patterns. I credit my daughter for this idea. I would have crammed them in the closet with my fabric. This is a much better solution. Again very little digging. They are sorted by designer. If you look closely you will see dividers between the patterns. I found these great spring loaded drawer dividers at Target. They were a little pricier than I wanted to spend ($16 per box) but they work great!! I used to store my patterns in those pattern boxes commonly seen in fabric stores. This is much nicer. No longer am I pulling out box after box to dig through and then have to replace in the closet. I just shut the drawer. I hope that answers your questions. Feel free to ask questions if I neglected something. REMINDER: Don't forget only a couple of days left to leave a comment for the Sew Beautiful Blog Tour giveaway. Thanks for all the details! 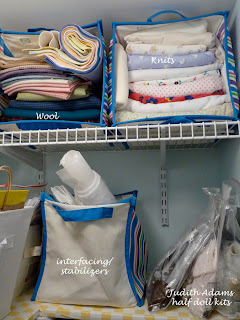 I love your organization and may just use several of your ideas as I embark on my own sewing room makeover. I tend to lump all the good cottons together, and really have to dig through them. I'm not much of a digger, either. I certainly enjoyed that little tour. Looks like you are very organized. It's just hard for me to stay organized, but I try. 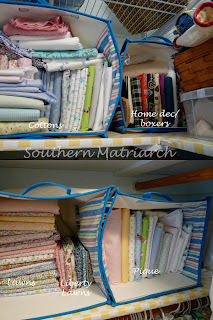 I can say that I love having my fabric folded... drank the koolaid I did. 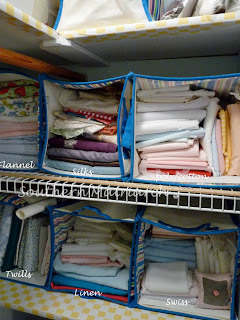 I do have some quilting stash that you do not have, hence the reason mine is more and I have lots of flannel for PJs. 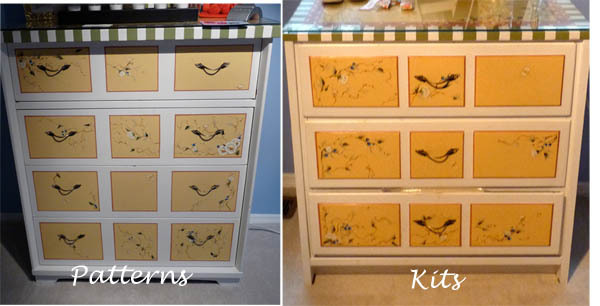 I do like your drawers for the patterns. Mine are in boxes from Ikea. I have the CC's sorted by name and then a box with OFB patterns and some others.. the rest are not in order well, but are in my pattern book. The OFB gown was not in CN, just the instructions to do the snail sheering.